The various spaces within the Community Centre are available for hire to members and to the general public for community-based activities, and for business or private events and functions including: weddings, private parties, children's parties, etc. Whenever you consider staging an event at the Centre, please contact the Community Centre Manager in order to place your booking and discuss arrangements. If a date is not available please contact us as we may be able to accommodate you. We will advise you on any licensing or other legal requirements, as these can take some time to arrange, please make bookings well in advance. For anyone holding a private event at home, tables and chairs are all available for hire from the Centre. Ideal for concerts, meetings, workshops, keep fit, badminton, dances, parties: including wedding receptions, children’s birthday parties. Occupancy maximums Theatre style 180, 140 café style, 110 ceilidh. Ideal for smaller meetings, talks, presentations, coffee mornings, Bridge and Mahjong meetings. Max occupancy 40. Ideal for smaller meetings. Max occupancy 20. 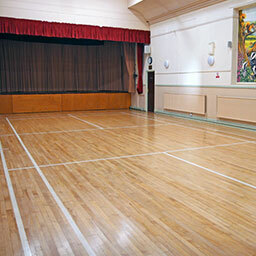 Ideal for exercise classes, children's dance, meetings. This is the main room in a small suite of rooms that includes a kitchen, and toilets. Max occupancy 50.